Length: 1 Hr, 18 Mins. 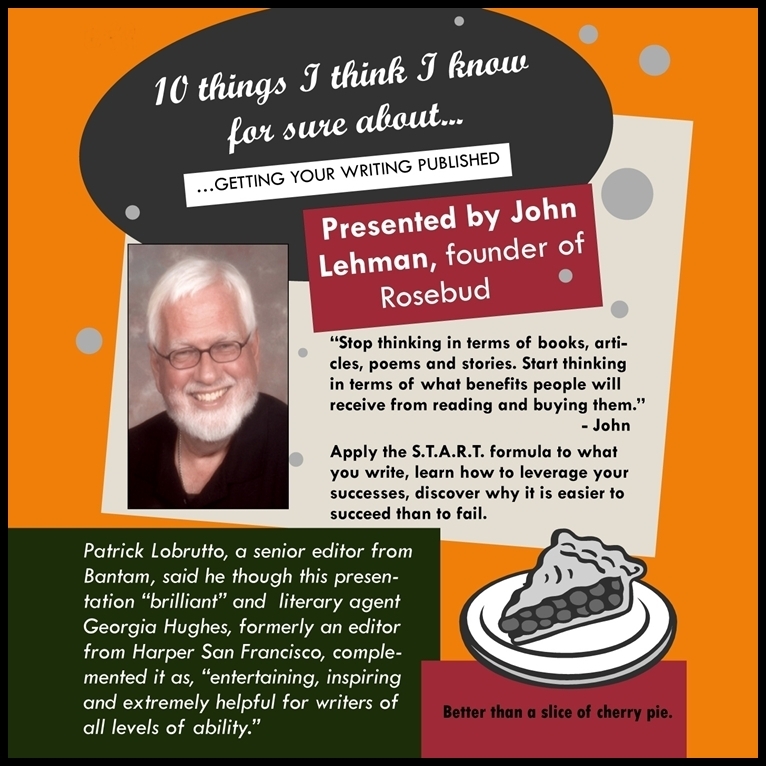 10 Things I Think I Know For Sure About...Getting Your Writing Published is presented by John Lehman, founder of Rosebud magazine. Lehman suggests writers stop thinking in terms of books, articles, poems and stories, and instead start thinking in terms of what benefits readers will receive from reading and buying them. Literary agent Georgia Hughes, formerly an editor from Harper San Francisco, has called this 78-minute program, "entertaining, inspiring and extremely helpful for writers of all levels of ability." John Lehman is a nationally published writer and poet with twenty years experience as a professional speaker and fifteen years as a creative director and senior copy writer for advertising agencies. He is a graduate of the Great Books Program at Notre Dame University and has a Masters Degree in Curriculum Development from the University of Michigan. John has presented seminars throughout the country. He is a book reviewer, business columnist, poet and free-lance feature writer for magazines and newspapers. His articles have appeared in The Christian Science Monitor, Popular Science, Omni and in more than fifty other trade/consumer publications. He is also founder of Rosebud, managing partner of Zelda Wilde Publishing and the poetry editor of Wisconsin People and Ideas.